September is in full swing, and it’s the time of year that we start heading back into the classroom - some of us are already in school, and some of us are still counting down our last few precious days of summer vacation. Setting the stage for a new school year is crucial, but it can also be a complex undertaking. So we decided to round up some resources to help you start the school year off right! There’s something here for everyone: whether you’re a teacher, a school leader, a district administrator, or a learning coach; if you’re exploring what personalized learning, competency-based education, or innovation in the classroom; if you are working on developing leadership, professional development, or strengthening communication and collaboration; and whether you need an overarching view of the education journey or help with one piece of the puzzle. Personalized learning takes many forms inside the classroom. Learn about some of the simple changes and activities that can take your classroom instruction to the next level, and get students involved in the redesign process. If you’re brand new to personalized learning, it can seem like a large, daunting undertaking. Here are some of the ways you can introduce PL to your school or district with little friction, and without having to dive into a complete overhaul. 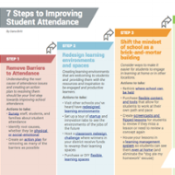 Teachers know that students missing school has a drastic effect on their learning and success - follow this guide to reduce missed days, increase learning time, and set your students on the path to success. You’re a leader who cares about investing in and nurturing the growth of your team, and this infographic is for you. 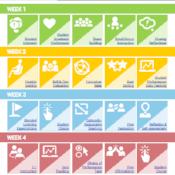 We’ve developed 8 key design elements based on best practices for employee engagement and retention from other sectors, to improve teacher retention. 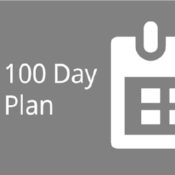 If you’ve been thinking about implementing PL in your classroom this year, here’s a walkthrough of the first 20 days of a school year, with 5 practical tactics to implement every week to personalize learning for students. There’s a lot we can learn from corporate organizations to take districts and schools to the next level - such as the constant drive to innovate. Learn about the key ingredients to build a culture of innovation, how to incorporate them into existing teams, and how to create the momentum for growth. 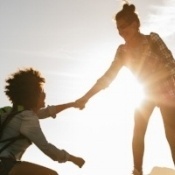 Much like that of student and teacher, the relationship between a learning coach and instructors needs to be built on trust and mutual respect. Here are some tips to spark the necessary chemistry and make sure you start the relationship off right. 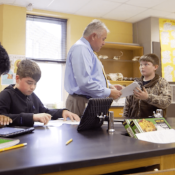 Whether you’re a first-time superintendent, or you’ve moved to a new district - being a superintendent comes with many challenges and high expectations. Here’s what you can do to create the foundation to exceed those expectations at your new district. The Core Four Elements of Personalized Learning are the essential elements we believe ensure that PL is implemented successfully. 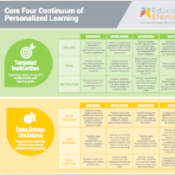 We developed the a comprehensive framework which outlines activities to support the Core Four Elements of Personalized Learning at every stage of implementation. Families are often on high alert for terms like “increased testing” and “more technology”. The perception of personalized learning outside of the classroom can vastly differ from what goes on inside the classroom. 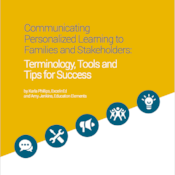 This white paper shares the results of surveys and message testing and analyzes which education terminology makes families nervous, and how to better explain your class or school methodology. We hope you find these resources useful, and we’re excited to see what you all will accomplish in the 2018-2019 school year. We continue to be inspired by your creativity, innovation, and dedication – which has sparked the creation of many of the resources shared above. Keep sharing those wonderful ideas and your school and classroom wins. Have a great year! 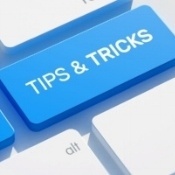 To get updates on more useful resources, sign up to receive our weekly blog notification.